If you are using a Solid State Drive (SSD), you should know that you shouldn’t run any defragmentation or free space consolidation software on it. So how do you clean up your SSD and free up the empty space? TRIM is the command we use to inform the OS to do the cleaning job. Windows 8 comes with the “Optimize Drive” feature that can run the TRIM command regularly. What about Ubuntu? How can you enable TRIM for SSD in Ubuntu? We’re a big fan of solar technology, and even bigger fans of the Raspberry Pi. So when we found that Adafruit had some cool parts that would let us run a solar-powered Raspberry Pi, we got to work! The idea is simple, a Raspberry Pi that can safely and happily live outside without any wires that would keep it close to home. This is a small tutorial, which will show you how to set up a local Raspberry to serve as a so-called SOCKS 5 proxy-server for your local network. The Raspberry itself will connect to a remote server, which will then make the requests to other Internet servers with it’s own IP, thus masquerading the original requestor’s. All computers on your local network can be configured to connect to the Raspberry, so they all can share the same connection to the remote server. Why would you want to run a file server off a Raspberry Pi? Maybe you want a small server that is always on and low voltage. If you need something that you can send and recieve files to and from than this might be your solution. The Raspberry Pi is low voltage running at just 5.0V ±5%. This means that your server will end up costing you around $5 a year. When using ssh -D to setup a socks proxy, DNS queries and DNS traffic are not sent through the ssh tunnel. However, with Firefox a config change can be made to send DNS traffic through the ssh tunnel. Here’s how it works! VERY IMPORTANT NOTE: THIS IS NOT A HOW-TO ARTICLE. 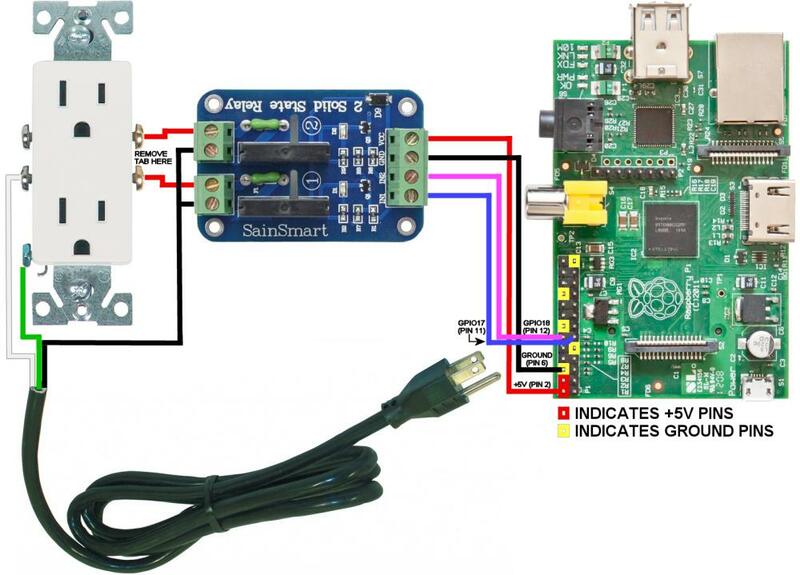 This article explains how the author used a Raspberry Pi to control electric current. However, the author is NOT an electrician, and just because he did something doesn’t mean YOU should, particularly if you are unfamiliar with how to wire electrical devices safely. WIRING A DEVICE IMPROPERLY CAN RESULT IN FIRE, PROPERTY DAMAGE, BODILY INJURY, AND/OR DEATH! So DO NOT just blindly do what the author has done, unless you are certain you know what you are doing and are willing to take full responsibility for your own actions! This article is for INFORMATIONAL PURPOSES AND DISCUSSION ONLY, and is NOT intended to be a guide to building any device! WE ARE NOT RESPONSIBLE IF YOU ATTEMPT TO BUILD ANYTHING BASED ON WHAT YOU SEE IN THIS ARTICLE AND INJURE YOURSELF OR HAVE PROPERTY DAMAGE AS A RESULT. STOP READING THIS ARTICLE NOW IF YOU ARE UNWILLING TO TAKE FULL RESPONSIBILITY FOR YOUR OWN ACTIONS!!!! AGAIN, THIS IS ONLY TO REPORT ON WHAT THE AUTHOR OF THE ARTICLE DID, AND WE ARE NOT SUGGESTING THAT YOU DO LIKEWISE, PARTICULARLY IF YOU DO NOT FULLY UNDERSTAND AND APPRECIATE THE DANGER OF WORKING WITH LIVE ELECTRIC CURRENT! PLEASE CONSULT WITH A LICENSED ELECTRICIAN BEFORE ATTEMPTING TO BUILD ANYTHING THAT WILL UTILIZE HOUSEHOLD ELECTRICAL CURRENT! The above circuit uses a SainSmart 2 Channel 5V Solid State Relay Module Board. Unlike the Solid State Relays mentioned earlier, these devices do require a +5 volt power connection, but they only require a trigger voltage of 2.5V – 20V. We purchased one of those and tried it, and had no problem triggering it from the Raspberry Pi. However, we no longer recommend these due to the low current rating of the relays, as explained below. Or, just visit the manufacturer’s page for the ModMyPi PiOT Relay Board. This unit is sold on Amazon by Elegoo, and the only caveat is that it appears the GPIO pin states are inverted from what you’d expect. So, when a GPIO pin is at logical 0, the relay turns on, and switching it to logical 1 turns the relay off. However the relays have both normally open and normally closed contacts, so you should still be able to control whatever you want to control. 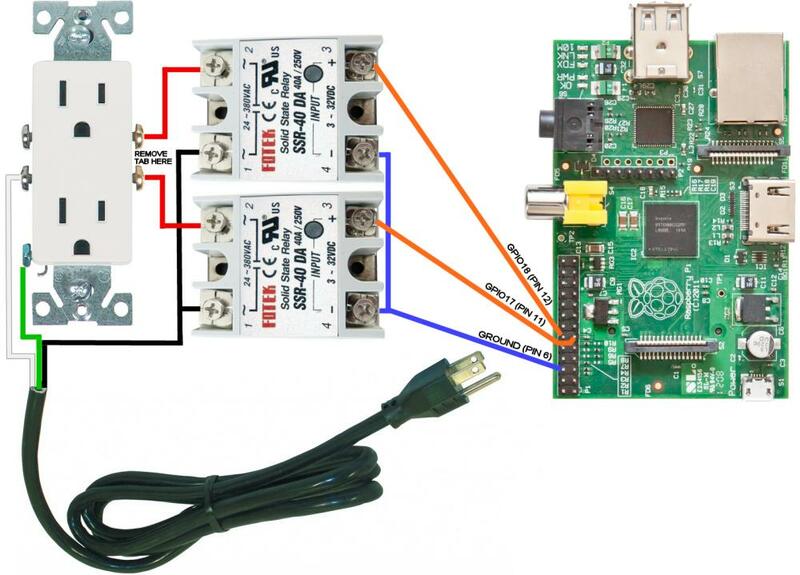 If you can wrap your head around that, these work well – all you need to do is connect the Raspberry Pi to the 10 pin strip on the relay board: The Vcc pin on the relay board connects to 5 volts on the Pi (Pin 2), the Gnd pin on the relay board connects to any of the GND pins on the Pi (pin 25, for example), and the other pins (In1 through In8) connect to GPIO pins on the Pi (we suggest using the pins that are color coded green in the pinout diagram on this page). EDIT August 26-28, 2013: Someone (not us) posted a link to this article on Reddit, where in the comments it was criticized for showing a regular outlet in a circuit that can only draw 2 Amps. One commenter labeled this “a pretty irresponsible article” and noted that “using a 2 amp rated, but normal looking outlet with nothing to interrupt the circuit if it is overloaded sounds like a terrible idea and risks starting a fire. It is not hard to exceed 2 amps.” But as someone else noted, you can’t readily purchase a special outlet that is intended for use only with smaller loads. We only show the outlet to illustrate how a small device, for example a device powered by a typical “wall wart” power supply that only draws a few watts, could be controlled. The diagrams above are for conceptual and illustrative purposes only – we are NOT actually advising you to build any such circuit or to use that type of outlet, but if you nevertheless attempt to build such a thing and thereby assume all the risks of doing so, we at the very least suggest you affix a conspicuous label showing the maximum amperage and wattage ratings (for example: MAXIMUM RATING 2 AMPS / 220 WATTS PER OUTLET or whatever is appropriate for the circuit you build). It might also be a good idea to put some type of additional protection, such as a 2 amp fuse or circuit breaker, in each leg of the circuit between the hot side of the outlet and the Solid State Relay Module Board. Or, a far better alternative would be to substitute one of the mechanical relay boards with relays rated to handle 10 Amps (and of course, be careful to never connect anything drawing more than 10 Amps to an outlet). But again, this is not and was never intended to be a hardware construction article, so if you attempt to build anything such as this, please be sure you know what you are doing! We notice that the harshest Reddit commenters were apparently too cowardly to leave their most scathing comments in our comment section, where we might have addressed them more directly. Since we are not Reddit users (we read it very occasionally, but don’t post there) we will not further dignify some of their more irrational statements, particularly since the true intent of this article was to explore the methods that can be used to control a circuit of this type. In other words, the focus of this article is the software, not the hardware. 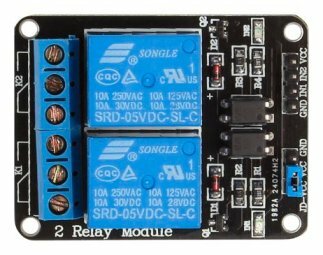 But on that topic, for those that are interested in the hardware side of things, we’ll just note that SainSmart also makes these Solid State Relay Module Boards in 4-channel and 8-channel models. If you prefer the boards with mechanical relays rather than the solid state type, those also come in 4-channel and 8-channel models. We were a little concerned that the power supply used to power the Raspberry might not support the additional load of the control circuits on the solid state relays. According to the description on the SainSmart site, the board we used requires 5 Volts DC at 160mA. According to this page on the Raspberry Pi web site, “Model B owners using networking and high-current USB peripherals will require a supply which can source 700mA (many phone chargers meet this requirement). Model A owners with powered USB devices will be able to get away with a much lower current capacity (300mA feels like a reasonable safety margin).” We aren’t using any USB peripherals at all, let alone high-current ones, and the power supply we are using produces 1000mA (1 Amp), so it would appear that the power consumption is well within the power supply’s capacity. And, we haven’t had any power issues. Still, it might not hurt to oversize your power supply a bit (use one rated for 2 Amps, for example), particularly if you are using the mechanical relays. EDIT (September 21, 2016): If you do not wish to build your own device OR do not have the knowledge to do it safely, there is a commercial alternative available that may work. We are NOT recommending this, simply because we have neither owned nor tested one, and we do not know if it has received the necessary approvals for various countries, including wherever you may live. We’re simply alerting you that this product exists, but if you choose to buy one we assume no responsibility whatsoever for any outcome of your decision, good or bad. A single input signal switches four outlets: 2 normally on + 2 normally off. Standard 24″ C-13 detachable cord included free, cords up to 25′ are optional. For those that have wanted a solution that did not require building from scratch, this might be it, at least in countries that use 120VAC as the standard voltage and use the standard USA/Canada style power outlet. We do not know at this time whether the scripts below would need any modifications to work with this device. That section delays a random amount of time (0.1 to 0.42767 seconds), then checks to see if the script is already running, without writing anything to the Raspberry Pi’s SD card (which could shorten the card’s lifespan if done too frequently). If the script is already running it bails out. While it is unlikely that a user would attempt to start the same script twice, this pretty much guards against it. That’s also the point of the “sleep 3” at the end of the script, which keeps devices from being toggled on or off too quickly. If you know of a better way to do this, feel free to modify the script, and also to post your suggested modifications in the comments (but, please do not suggest reading man pages. If that is all you can be bothered to offer, please just move along). The [custom-picontrol] context above actually allows you to enter any of the possible GPIO pins (available to the user) on the Raspberry Pi, but in our example we’re only using pins 17 and 18, so if you don’t plan on using any other GPIO pins, you may want to remove all the lines that start with exten => N, where N is any number other than 17 or 18. The first two contexts are based on FreePBX IVR logic, except that instead of using the selection to transfer to an extension or other destination, the choices made are stored in variables for use by the [custom-pincontrol] context. If you are handy with an audio editor such as Audacity, you can probably slice the word Pin off of one of the existing recordings that start with the word “Pin” (found in /var/lib/asterisk/sounds/en for English-language speakers). For the others, you can record them yourself, or you could perhaps use text-to-speech software to generate them. There’s also the option of using flite text-to-speech synthesis if it is installed on your system, but you’ll need to modify the contexts accordingly (we don’t care for the sound of flite, so you are on your own with that). Then go into Applications/Misc Applications and add a new Misc Application called “Raspberry Pi Control” or whatever you want. Give it an extension number you want to use when controlling pins on your Raspberry Pi – we used 774 (“RPI” on a standard touch-tone keypad). For the destination, select “Custom Destinations” and “Raspberry Pi control”, then apply the changes and you should be all set. Replace IP_address_of_Raspberry_Pi with the IP address of your Raspberry Pi – of course, this works best if the Raspberry Pi is always on the same IP address. Now every time you press the red button on the remote, GPIO17 on the Raspberry Pi would toggle to the opposite of its current state (since no option is specified). And if you pressed the blue button, GPIO18 would toggle. So you could use a remote on a different system to send commands to the Raspberry Pi to power a device on or off. Or you could create a script or program that switches things on or off at certain times. We’ve actually done this so we know it works! There is software available that allows you to use a web interface to control the GPIO pins, such as BerryIO and WebIOPi. It seems that the possibilities are endless. I could envision building something like an automatic lawn watering system controller that could go out and download the weather report, and then decide to water or not water based on the probability of significant amounts of rain. That’s just one example of the sort of thing you could do if you have the ability and the expertise. Again, should you foolishly ignore our advice to not try building anything like this unless you know how to protect yourself when working with household electrical current, PLEASE remember to use extreme caution! We would really hate to see anyone kill or injure themselves, or set their house on fire (but we will not be responsible if you do that, because we’ve warned you every way we can think of! ).